Reminiscient of the early ribbon farms whose long, linear shape offered settlers a slice of arable land and riverfront access, our vision for a new riverfront park in Detroit re-establishes a meaningful connection between the city and the river by both pulling the park back into the city and extending it out into the river. Through a combination of physical and visual connections, as well as, programmed and un-programmed spaces, the new park will reveal new opportunities to experience and appreciate one of America’s greatest cities. Using the historic layout of the ribbon farms established in the original French settlement as a point of departure, the park follows a series of strong transverse axes that serve to form a connection between the river and the city. On the city edge of the park, these organizational axes direct the park into the fabric of the city and the city out into the park. In order for this approach to be effective, the existing boundary that is created by Jefferson Avenue is overcome by pushing the street below ground and allowing “bridges” of parkland and city streets to extend across. The parkland bridges become new green spaces between buildings in place of existing streets while Woodward Avenue, the city’s most iconic street, extends into the new park as a Boulevard of Monuments. The riverside edge is similarly reconfigured to follow this new axial organization. 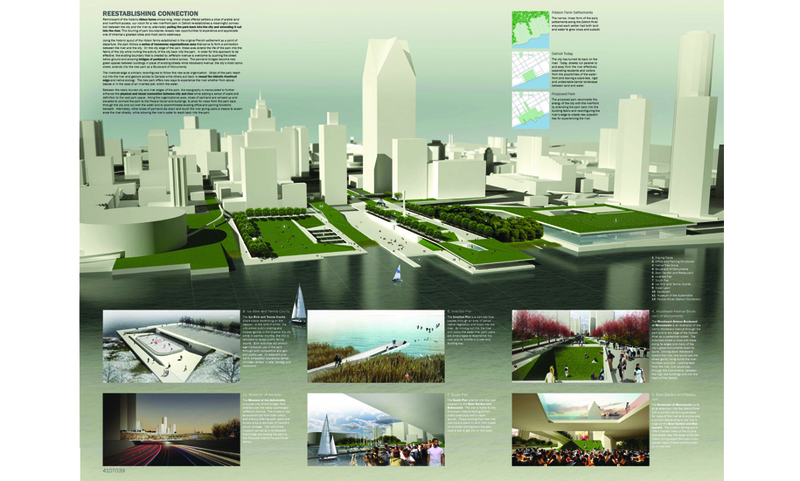 Strips of the park reach out into the river and gesture across to Canada while others pull back to reveal the original riverfront edge and ecology. The new park offers new ways to experience the river whether from above, beside or in the case of an inverted pier, within the water. Between the newly blurred city and river edges of the park, the topography is manipulated to further enhance the physical and visual connection between city and river while adding a sense of scale and definition to this large space. Along some of the organizational axes, slices of parkland are ramped up and elevated to connect the park to the People Mover and buildings, to allow for views from the park back through the city and out over the water and to accommodate existing office and parking functions beneath. Meanwhile, other slices of parkland dip down and touch the river giving users an opportunity to experience the river while restoring the historical edge of the city and its native ecology. Within the new park, a variety of programmed and un-programmed spaces are offered to satisfy a wide range of users. At the northeast end, playing fields stretch across the roof of the new office and parking structures and offer an elevated view of the Renaissance Center. Below the playing fields, a band of native trees stretches from the river back to the buildings offering a glimpse into the city’s ecological past. The Woodward Avenue extension offers a new home to the monuments that are currently scattered through the park. This new Boulevard of Monuments slowly rises as it extends to the river allowing a new perspective looking back through the city and the monuments. Southwest of the Woodward Avenue extension, a band of park extends over the Jefferson Ave submersion and houses a new Museum of the Automobile. Adjacent to that an open lawn allows for summer movie viewings and concerts, as well as, a place to eat lunch or sunbathe. The southwest edge of the park provides another native planting zone that stretches back between the buildings and beneath the People Mover.